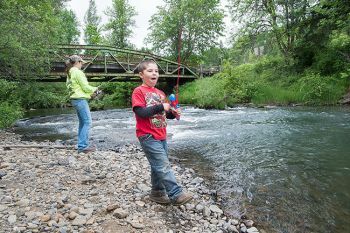 Grayson Goings and his mother, Courtney, enjoy a day of fishing at Willamina Creek in Blackwell Park. Several of the county parks have water access. 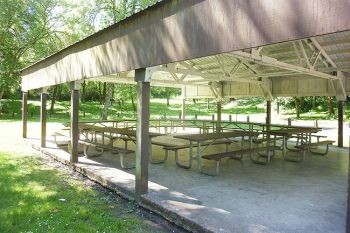 Ed Grenfell Park offers a large picnic shelter and grills that can be reserved for groups or used by visiting families. David Young enjoys walking around Blackwell Park near Willamina with his two dogs, Merlin and Lily. Only a few miles west of McMinnville, Ed Grenfell County Park offers a kind of quiet you won’t find in town — a musical quiet, lush with the rushing of Baker Creek, the singing and calling of birds, the whisper of wind in the trees. Occasionally a car zips past on Baker Creek Road. Then the musical quiet returns. Listen closely, and you may hear the buzzing of bees pollinating blackberry blossoms, or the flapping of yellow butterfly wings. Of course, Ed Grenfell and the other parks in the Yamhill County Parks system aren’t always so quiet. They’re often filled with the chatter of picnickers, the laughter of children splashing in the water, the celebratory barking of Frisbee-catching dogs. But whether you’re the only visitor on a weekday morning or one of hundreds socializing on a Saturday afternoon, the parks offer a place to play, relax and enjoy nature’s beauty. This summer, make exploring the county parks part of you vacation or your weekend plans. So pack some sandwiches and drinks and spend a few hours at Blackwell Park, a shady spot just north of Willamina, or at Menafee Park, northwest of Yamhill. Or explore unusual vegetation at Deer Creek Nature Park, near Sheridan. Learn about Yamhill County’s past at Lafayette Locks Historical Park, where you can seek the locks that helped make the Yamhill River a superhighway. Or put your canoe into the river at the Dayton Landing and check out the river from a different perspective. If you’re coming back from a visit to the beach, pull off at Stuart Grenfell Wayside Park, alongside Highway 18 at Harmony Road. Stuart Grenfell gets more visitors than any of the 16 other Yamhill County parks, according to Brett Henry, parks director. But for most people, it’s just a place to stretch their legs between destinations. You may want to come back again and explore this park more thoroughly another day. Or take a day for a tour of West Valley parks — Stuart Grenfell, Blackwell and Deer Creek — stopping at interesting shops in Willamina and Sheridan in between. Or make a north-northeast loop, visiting Menafee, then returning to Yamhill and taking back roads over the Dundee Hills to Crabtree Park. Drive into Newberg to reach Rogers Landing, with its boat ramp access to the Willamette River, or turn back toward Lafayette and finish with a stop at Lafayette Locks. Or go west on Baker Creek Road, visiting not just Ed Grenfell Park, but also smaller and less crowded Huber Park, with bubbling Baker Creek as its centerpiece. Three other parks are located farther up Baker Creek Road — Powerhouse Hill, Juliette and Charles Metsker. The former two have yet to be developed, though, and the latter is open only to educational groups. Yamhill County’s park system dates back to 1955, when a group of citizens got together with the Yamhill County Board of Commissioners to discuss the idea of setting aside land for residents to use. The crumbling locks structure at Lafayette was one of the driving factors. Supporters wanted to preserve the historic structure to remind future residents of the role the river played in the history and economy of the county. Lafayette Locks became a county park in 1957. But by that time, the county already had other parks. Edwin and Ruth Huber donated 3.66 acres for the first park in 1956. The same year, James and Gertrude Creger deeded the site of the Dayton boat landing. Another park was added in 1959 — Blackwell. The Paul Blackwells and the Pearl Blackwells, a pair of Willamina couples, donated the land. Ken and Barbara Knutson donated the land for Stuart Grenfell Wayside, naming it after an early parks board member. Deer Creek, Ed Grenfell, Menafee, Huber, Rogers Landing and the others followed. And the system continues to grow. Soon it also will include the planned Yamhelas Westsider Trail, a linear park along the old railroad bed from McMinnville to Gaston and beyond. Yamhill County parks are overseen by a citizen board, with help from Henry, who became director in 2014. A native of New Orleans, he previously managed parks in Louisiana. He’s excited about the changes and improvements underway in some of the parks. For instance, an off-leash area for dogs is being constructed at Ed Grenfell, the closest park to McMinnville. Featuring two sections, one for shyer dogs, it should be competed in mid-June. Other changes include slight modifications to the names of several parks to emphasize their special characteristics. For example, the parks board added “historical” to the name of Lafayette Locks because of its storied past, and “nature” to Deer Creek’s name to highlight features such as wetlands, Fender’s Blue butterflies, and camas and other plants no longer found in most parts of the Willamette Valley. Henry and the board also are making plans for the as-yet-undeveloped sites, such as Juliette and Powerhouse Hill. Both have historical significance, since they contained equipment used to generate electricity for McMinnville. They need interpretive signs, as well as restrooms and other typical park infrastructure, Henry said. A small parking lot already exists at another partly developed site, Wrex Cruse, adjacent to Highway 47 at Cove Orchard. Visitors can climb a hill to see expansive views of the north valley, but they won’t find groomed trails or restrooms at this small park. Also waiting for development is Whiteson Park, located along the South Yamhill west of Highway 99W. It may eventually be the scene of a full-service park with camping, becoming the county’s first overnight facility. But for now, it’s just empty acreage. 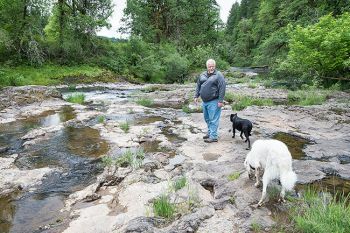 Parks board member Jim Culbert, a retired U.S. Forest Service employee, is eager to see attention focused on those sites. A paddler, he also would like the county to develop a water trail with access points on the Yamhill. First, he said, the parks board needs to revise its outdated master plan. And to do that, it needs to find out what county residents want from their parks. Those wants may be as diverse as the offerings already available in the county’s 17 parks. It’s that variety that people such as Suzanda Branson, another member of the parks board, find especially appealing. She’s looking forward to letting her German shorthair pointer and her Boston terrier/chihuahua run in the new off-leash area at Ed Grenfell Park. News-Register Publishing Co., P.O. Box 727, McMinnville, OR 97128. This website is intended to encourage local residents and visitors to explore and experience the Yamhill Valley in the heart of Oregon wine country. wineries, tasting rooms, lodging, dining, the Spruce Goose Evergreen Aviation and Space Museum and water park, and much more. Find information about McMinnville, Carlton, Newberg, Dundee, Amity, Dayton, Lafayette, Sheridan, Willamina and Yamhill.